Chirps and Cheeps | A Red-breasted Nuthatch Eats from my Hand! 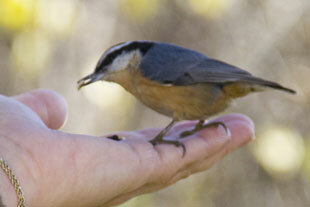 So - the next step was to WEAR the glove and try enticing the birds to eat from my hand with the glove on. But today, impatient as I am, I just went ahead and skipped that step, anxious to see if they would comply! Sure enough! A little male, red-breasted nuthatch obliged - and not only once, but he came back several times! I expected a chickadee to be first. In between his visits, I set up my camera on a tripod and got some mediocre shots to prove I wasn't dreaming! How cool!! !